Ten years ago, college student Quincy Carpenter went on vacation with five friends and came back alone, the only survivor of a horror movie-scale massacre. In an instant, she became a member of a club no one wants to belong to—a group of similar survivors known in the press as the Final Girls. Lisa, who lost nine sorority sisters to a college dropout’s knife; Sam, who went up against the Sack Man during her shift at The Nightlight Inn; and now Quincy, who ran bleeding through the woods to escape Pine Cottage and the man she only refers to as Him. The three girls are all attempting to put their nightmares behind them, and with that, each other. Despite the media’s attempts, they never meet. Now, Quincy is doing well—maybe even great, thanks to her Xanax prescription. She has a caring almost-fiancé Jeff; a popular baking blog; a beautiful apartment; and a therapeutic presence in Coop, the police officer who saved her life all those years ago. Her memory won’t even allow her to recall the events of that night; the past is in the past. That is, until Lisa, the first Final Girl, is found dead in her bathtub, wrists slit, and Sam, the second, appears on Quincy’s doorstep. Blowing through Quincy’s life like a whirlwind, Sam seems intent on making Quincy relive the past, with increasingly dire consequences, all of which makes Quincy question why Sam is really seeking her out. And when new details about Lisa’s death come to light, Quincy’s life becomes a race against time as she tries to unravel Sam’s truths from her lies, evade the police and hungry reporters, and most crucially, remember what really happened at Pine Cottage, before what was started ten years ago is finished. Riley Sager is a pseudonym for an author who has been previously published under another name. A native of Pennsylvania, Riley is a writer, editor and graphic designer who now lives in Princeton, New Jersey. In addition to writing, Riley enjoys reading, movies and baking. 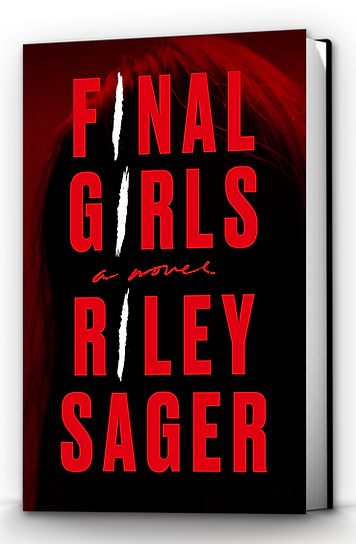 Riley’s first novel, FINAL GIRLS, will be published in July in the United States, the United Kingdom and fourteen other countries around the world. We will pick the winners on May 5th .